One of the primary goals behind any diet and exercise program should be improving the health and wellbeing of the person taking part in the program. However, all too many diet and exercise programs take a cookie-cutter approach to helping people meet their weight loss goals. What do we mean by a “cookie-cutter approach?” The cookie cutter approach is nothing more than a program that fails to take into account the unique needs of each person to participate in the program. 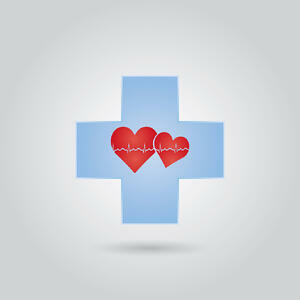 Things such as individual metabolic rates, health and lifestyle are not taken into account in these programs. Part of making sure that your weight loss program gives you the greatest improvements for your health and wellbeing is making sure that your unique needs are met; which is something that requires personalized, attentive care. One way in which a weight loss plan can help you maximize your weight loss and health improvements is by determining if medically-assisted weight loss is right for you. For some people, diet and exercise alone aren’t enough to meet their weight loss goals. In fact, for some people, the kind of heavy activity an exercise routine usually demands can be unsafe. For example, if a person with osteoporosis were placed on a strength training regimen, that regimen might help to improve bone health in the long run, but the risk of severe injury is so high that simply supplementing calcium intake might prove to be much more reliable and safe in the long run. A medical weight loss program can identify major medical conditions and dietary deficiencies, then create a personalized wellness plan just for you. By creating a personalized plan that takes your whole health profile into consideration, your results can be vastly improved as opposed to what could be achieved without the help of a doctor. Such a plan takes into consideration how much activity you’ll need to lose weight, how much activity is safe for you, and your dietary needs to stay in good health while losing weight. To further improve your results, the doctor supervising your medical weight loss program can prescribe vitamin supplements and appetite suppressants to complement your diet and exercise routine. For countless people, the demands of keeping up with a packed work schedule and the needs of their family doesn’t leave much time for following a generic diet and exercise routine. In fact, lack of time is one of the primary reasons why people so often turn to unhealthy fast food in order to satisfy their hunger. Because of this, sometimes, you might need a little help to keep eating healthy and meet weight loss goals. 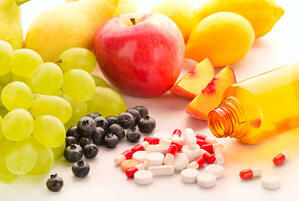 This is where the use of doctor-recommended vitamin supplements and appetite suppressants can be a big help. One of the leading causes of a failed diet is that dieters have a hard time resisting the temptation to go off-diet without help. Appetite suppressants help you fight the urge to snack and eat unhealthy foods by keeping your hunger in check. Used properly, appetite suppressants can help you safely stick to your diet plan. Another one of the major problems with many fad diets is that while they restrict the intake of calories and fat, they can also end up cutting certain needed vitamins and minerals as well. Vitamin supplements prescribed by a qualified nutritionist help you by making sure that your body is receiving all of the vital nutrients it needs to function at peak efficiency, preventing many of the negative side effects associated with extreme dieting. Only by thoroughly examining your physical condition can a doctor find out your nutritional needs and create a prescription for vitamin supplements that will provide a complete solution for improving your health and wellbeing. With continuous medical monitoring, these prescriptions can be updated as necessary throughout your weight loss program as your needs change. A successful weight loss program not only helps you shed pounds, it helps you to be more energetic and healthy. People who have successfully lost weight often report feeling more confident in their appearance and positive about their self-image. In short, losing weight not only helps you to be healthier, but it promotes mental well-being as well. 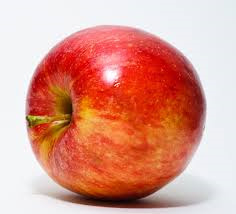 Each medium-sized apple -- approximately 3 inches in diameter -- contains 95 calories. Roughly 87 percent of these calories come from carbohydrates, and the carbs found in apples help you metabolize fats, allow your nervous system to function and help your muscle tissue hold onto its protein stores. Each medium apple also contains 4.4 grams of dietary fiber, a nondigestable carbohydrate that fights chronic diseases -- including diverticular disease and type-2 diabetes -- and helps keep you regular. The fiber in one apple contributes 18 percent toward the recommended daily fiber intake for women and 12 percent for men. POWER WALK/YOGA STRETCH CLASSES IN THE PARK START JUNE 4... call today to reserve your spot! Join us every Wednesday evening this summer for an hour of movement that will restore, rejuvenate, strengthen and energize you... after a long day at work or home with the kids/family. Email our fitness director Noelle Lusardi at Noelle@stepaheadwellnesscenter.com for more info or to sign up! We look forward to walking and stretching with you! POWER WALK/YOGA STRETCH CLASSES IN THE PARK... STARTING JUNE 4... RESERVE YOUR SPOT NOW! 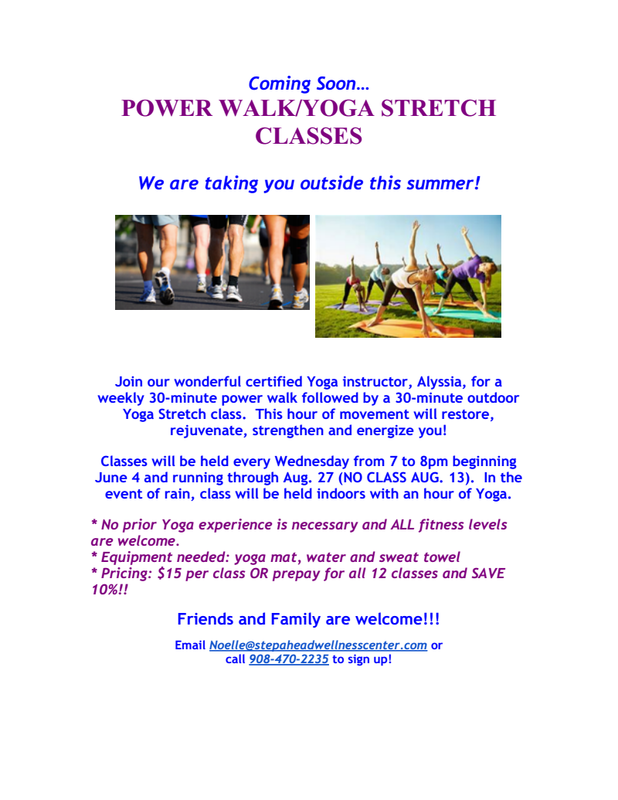 We are so excited to offer this new weekly POWER WALK/YOGA STRETCH IN THE PARK CLASS all Summer long. It's been a long winter so now let's take it outdoors and enjoy the fresh air. Contact Step Ahead Wellness Center's fitness director, Noelle Lusardi, at Noelle@stepaheadwellnesscenter.com for more information and/or to sign up! AMP UP YOUR ENERGY WITH THESE PRE-WORKOUT SNACKS! PRE-WORKOUT SNACKS TO REV YOUR ENERGY LEVEL! If you’re heading to the gym right after work, you may not have access to a fridge. That means you might want a good source of protein that you can eat at room temperature. Raw almonds are the perfect pre-workout snack for those on the run. They’re lower in calories than most varieties of nuts and can easily be packed in a baggie or reusable container. A handful can even be slipped in your pocket as long as you’re not afraid of a little lint. It’s a portable, protein-packed snack to munch to prepare you for your exercises. Forget anything negative you may have heard about bananas. When you’re working out on a consistent basis, you need some good carbohydrates to keep you going. Plus, the high amount of potassium bananas contain will help replenish your muscle function as you go along. That can help combat the soreness and stiff joints that typically accompany a hard workout. 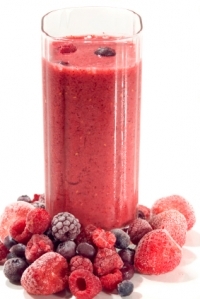 Smoothies are great pre-workout snacks since you can put in any healthy ingredients that your taste buds desire. Almond milk or yogurt could serve as a delicious base to get you started. Then, blend in some wholesome fruits like strawberries, pineapples and papayas. If you’re trying to build muscle, you can throw in a scoop of protein powder as well. The fiber from the fruit will digest quickly so you’ll feel an energy jolt moments after gulping everything down. A smoothie is a nice selection if you don’t have time to wait for slow-moving foods to make their way through your system. When you think of having a snack, eggs probably don’t immediately come to mind. However, these staples of the breakfast table are a solid choice no matter what time of day you work out. Try slicing a hard-boiled one over some kale or a piece of whole-grain toast. The protein of the egg along with the fiber of the greens or bread will help you power through your exercise routine. it out. These tasty options will help you work off those pounds and build up those muscles! for our latest weight loss programs and specials and for weight loss tips. Spring Challenge at Step Ahead... Earn a Fit Bit! 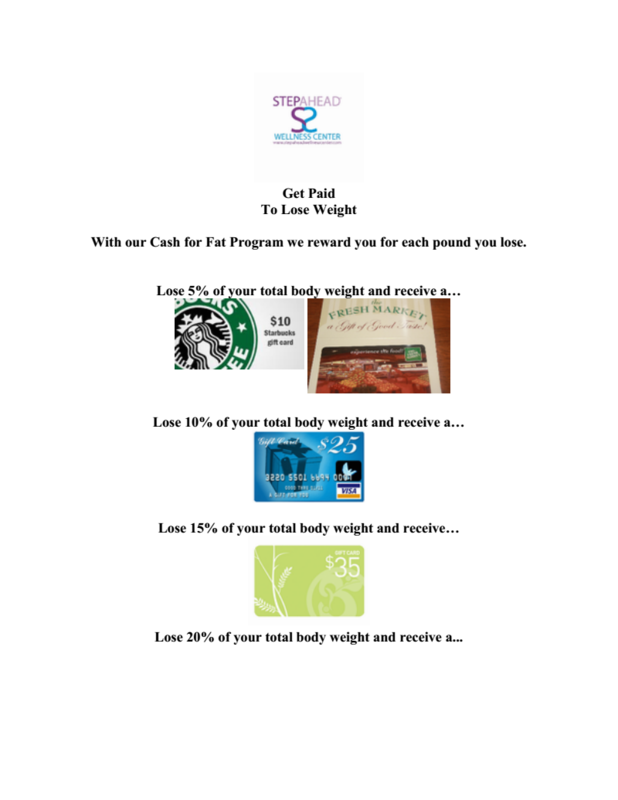 Get Paid to Lose Weight with Step Ahead! We will reward you as you progress and meet your ongoing weight loss goals with our "Cash for Fat" program. The ultimate reward is a FREE Fit Bit! See our full rewards program below. Call today for more information, 908-470-2235. And visit our website at www.stepaheadwellnesscenter.com for all of our weight loss programs and specials. Schedule Your FREE TRX Training Session Today! Step Ahead's fitness director/certified fitness trainer, Noelle Lusardi, is offering FREE 30-minute training sessions next week only! Call today to schedule your session 908-470-2235, timeslots are filling up quickly. TRX training will blast calories and challenge your muscles and cardio endurance like never before in as little as 30 minutes. If you're looking to jumpstart your weight loss goals and get fit before summer, train with us and TRX! 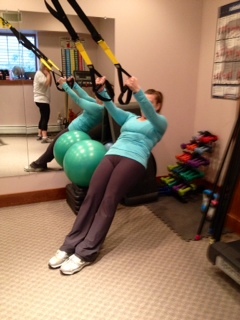 Pictured is our awesome client Julie demonstrating a TRX row during her training last night! 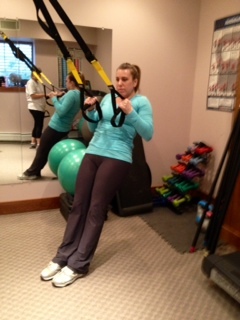 For TRX questions or for more info email Noelle directly at Noelle@stepaheadwellnesscenter.com. For more information on our weight loss programs and specials visit www.stepaheadwellnesscenter.com. Step Ahead Brings Fitness Classes to Local Companies! 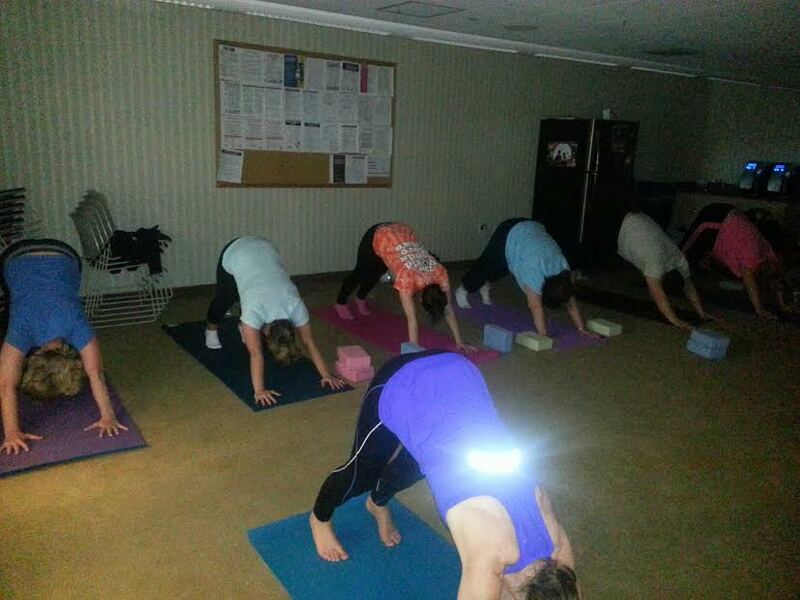 Our fantastic Yoga Instructor, Alyssia Saporito, takes employees at Peapack Gladstone Bank through another week of great classes! Interested in bringing fitness classes to your company? Call today for details -- 908-470-2235, or email our fitness director, Noelle Lusardi, at Noelle@stepaheadwellnesscenter.com. Let us bring fitness to you!